Does the notion of a Toyota Yaris land speed car sound crazy to you? Me too, which is why I love it. 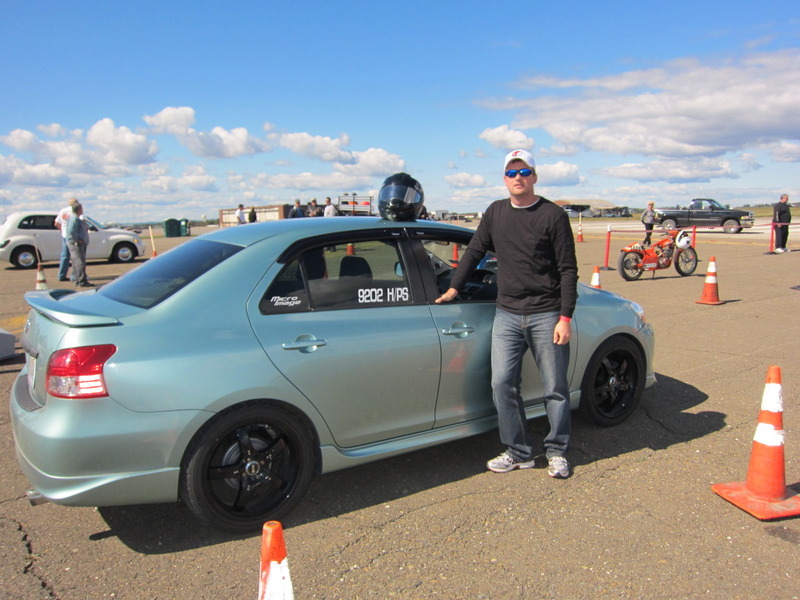 Adrian Tauer of Caribou, Maine entered his turbocharged 2007 Yaris S sedan into the LTA (Loring Timing Association) Land Speed Races, specifically their Harvest Event, outside of Limestone, Maine. The race is held at the former Loring Air Force Base, which features a two-and-a-half mile strip of asphalt, making it the longest asphalt land speed track in the world. These events are all about top speed: You get 1.5 miles to accelerate, and one mile to decelerate. Adrian ran his Yaris in the H/PS class, basically the stock 1500cc supercharged group, as he calls it. How'd he do? He reached a top speed of 120.91 MPH, and now holds the class record! As you may have guessed, Adrian's Jade Sea Metallic-colored Yaris is not stock. It showcases a custom T28 turbo kit making 7 PSI of boost. It also features an AEM FIC (fuel ignition controller), an HKS blow-off valve, a custom 2.5" mandrel-bent exhaust system, a high-flow catalytic converter, and a Magnaflow muffler. Rolling stock consists of 18x7.5 XXR 508s wrapped in Diamond Back 225/40/18 tires; a slightly larger-than-stock diameter which helps gearing, and increases the overall speed. In addition, he's got AMR springs to lower the car. There's a host of exterior goods, too including a carbon-fiber Micro Image hood. Of course, there is more in the works to make his Yaris sedan go even faster next year. "My goal is a 150 MPH pass next summer," says Adrian. We wish Adrian the best of luck at next year's run! In the meantime, you can check out a video of his 120+ MPH run.